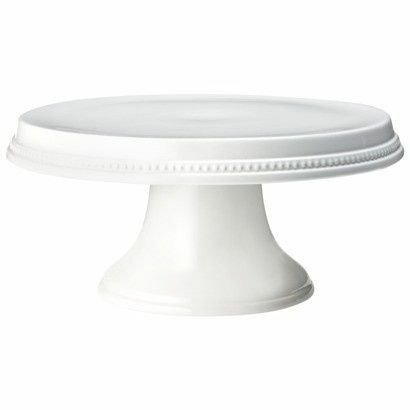 cheaper alternatives to cake stands? Having a small, rustic wedding with a small 2 tiered cake. Thought we were going to be able to borrow a cake stand from my florist, but it's uneven. I didn't realize how expensive stands were! What are cheaper alternatives anyone knows of?? You could just cut a tree slice and put it on that. Or you could just put the cake on the table with the foiled board underneath that the cake sits on. There is no reason a cake has to be propped up. I agree, that it can sit on the table and still look pretty. 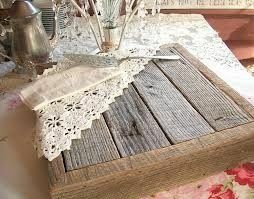 Or you could DIY something - cover a sturdy box with fabric or mod podge something interesting onto it. Maybe photos of you as a couple? I was going to suggest the tree thing. 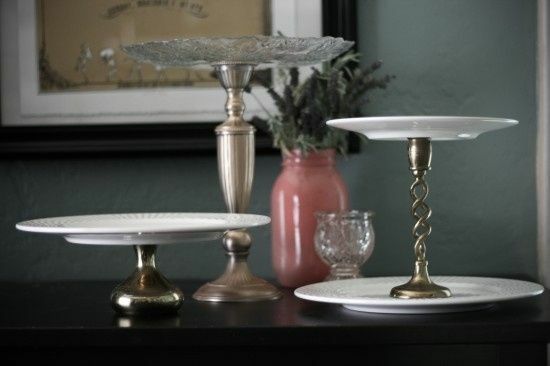 You could also check out yard/garage sales for cake stands or parts to make your own. For a small cake, a typical cake pedestal would work and you can pick those up for a just few dollars at thrift or antique shops. In fact, yesterday I was on eBay (looking up milk glass plates) and saw a bunch of milk glass cake pedestals. Hot glue a candle stick to a plate. I like the slice of the tree trunk or I would check out a marshals or something and see if you can get a generic but pretty cake stand that you can use again in your house.